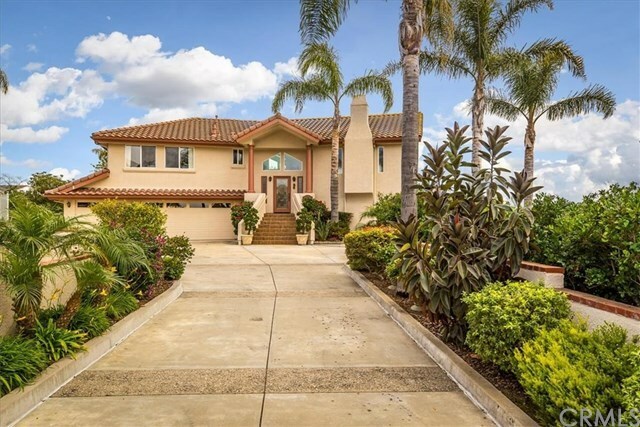 Stunning ocean views from this custom and immaculate home in a great Pismo Beach location. The views extend from Oceano dunes and north toward Shell Beach. Some of the many custom touches include granite kitchen counters, stainless steel appliances, and large pantry. As you enter this home there is a half-flight of stairs to the upper living area. Here you'll find an open floor plan with spacious kitchen, large living/dining area, powder room, and expansive master bedroom suite with a door to an outdoor balcony. Another balcony with gas-plumbed bbq is located just off the dining area. The floor below features two large bedrooms, a large bathroom, laundry room, storage closet, and access to the custom finished three-car garage. This home is move-in ready and in excellent condition. There are lots of sheltered outdoor spaces with lush, mature landscaping. Custom LED fireplaces with thermostats are found in the living room and master bedroom. Directions: James Way to Shamrock to Limerick, property is gated and sits back off of Limerick to the right.